Scrolling panels are versatile space-savers. They let you display more content than would otherwise fit on a slide. Learners just scroll vertically to see the additional content. 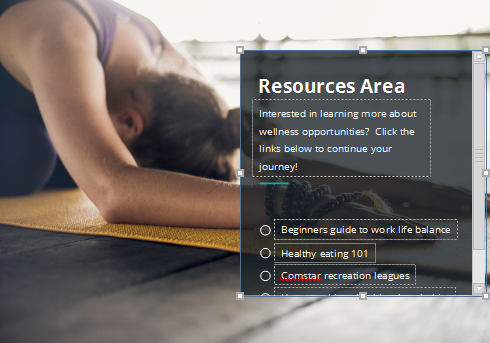 Scrolling panels can contain text boxes, shapes, pictures, videos, buttons, and more. In fact, they can hold anything except other scrolling panels and objects that originate from slide master placeholders. Use them on slides, layers, and even slide masters. Go to the Insert tab on the ribbon and click Scrolling Panel. To resize a scrolling panel, drag any of its sizing handles. To move a scrolling panel, drag it to a new location. Tip: If you're having trouble selecting a scrolling panel without accidentally selecting an object inside it, select the scrolling panel in the timeline instead. When your mouse is over the scrolling panel, release your mouse button to drop the object into it. If the object is taller or wider than the scrolling panel, part of it will be concealed by the boundary of the scrolling panel. Note: Although you can add objects to a scrolling panel that are wider than the scrolling panel, there won't be a horizontal scroll bar. Scrolling panels only support vertical scrolling. Select an object that you want to remove from the scrolling panel. Drag the object out of the scrolling panel and drop it on another part of the slide. Choose your own Shape Fill, Shape Outline, and Shape Effect. The colors available on the Format tab are controlled by your theme colors.